6th and Wells Office Building. Photo by Jeramey Jannene. 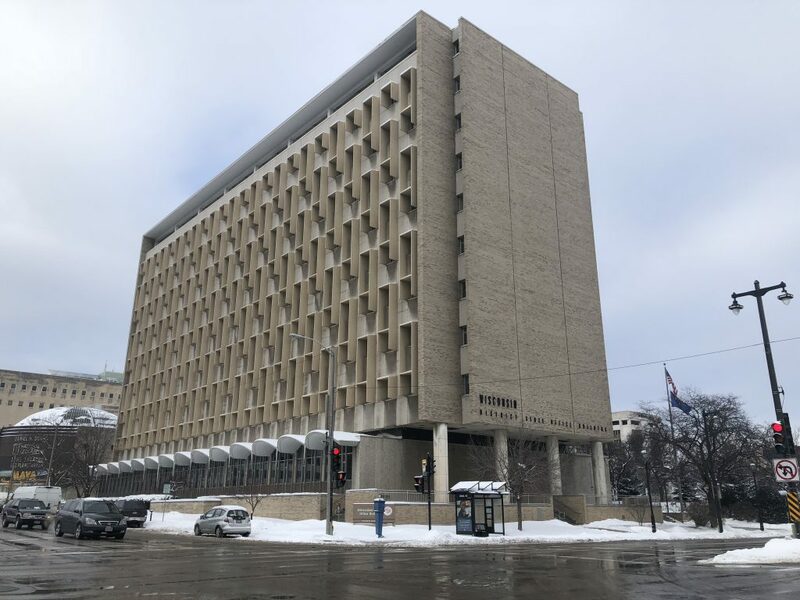 The State of Wisconsin plans to move about 600 employees out of a 55-year-old office building in downtown Milwaukee in a move that could save $1.2 million annually. 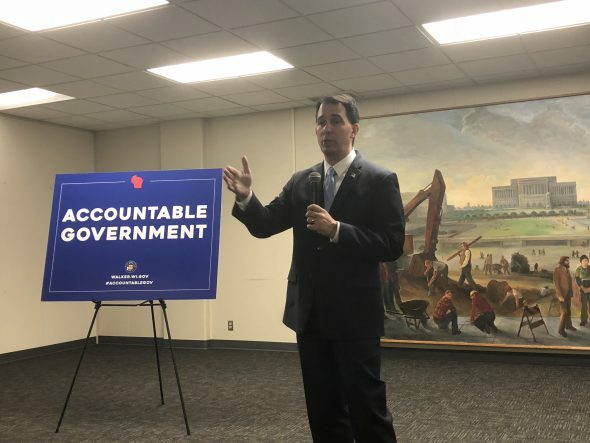 Governor Scott Walker held a widely anticipated press conference Friday morning to announce the release of a request for proposals for the site for a new state-owned office building. The state has budgeted up to $4 million to acquire the site. The future building will still be located in the city. The boundaries set by the RFP are W. Hampton Ave. to the north, N. Holton St./N Van Buren St./N. Milwaukee St./1st St. to the east, W. Mitchell St. to the south and Highway 175 to the west. Walker says the new building, which the state will build through a separate process, will have a catalytic effect on the area where it’s located. Accessibility via mass transit and driving are factors the state will consider in selecting the site according to the governor. They will also examine the potential to consolidate an additional five leased office spaces into the project. The $1.2 million in annual savings are estimated to come from energy savings, a reduction in 111,786 square-feet of office space leases and operational efficiencies. There is one recently assembled site that fits the bill, the southwest corner of N. 27th St. and W. Wisconsin Ave. Representatives affiliated with the Near West Side Partners were in attendance at the Friday afternoon press conference, including organization executive director Keith Stanley. He told Urban Milwaukee that the organization will bid on the site. An affiliate of NWSP will close on a $40,001 purchase of the remaining parcels in the block from the city in the next 30 days, said Stanley. Stanley, who has worked on redeveloping the 27th St. corridor for years, said: “there’s a value for this site for any developer.” Momentum to redevelop the area has been growing in recent months with the announcement that Ambassador Hotel owner Rick Wiegand would purchase and redevelop the former Wisconsin Avenue School at the northwest corner of N. 27th St. and W. Wisconsin Ave. into the Ambassador Suites hotel. Applications are due March 9th, with the state expected to pick a winning site on May 28th. The RFP indicates the state intends to close on the purchase on September 28th. Once the state owns the land, an entirely new process will begin to actually construct the building. The state’s Department of Administration will seek to have the cost of the new building, estimated at $50 million, included in the 2019-2021 state budget. It is anticipated that 30-year bonds would be used to pay for the project. Governor Scott Walker speaking at office building press conference. Photo by Jeramey Jannene. Representatives David Bowen and Jonathan Brostoff were in attendance at the press conference. The area where the current building is located is represented by Rep. Leon Young and Sen. LaTonya Johnson. Neither were present. The existing building’s site is ripe for development. “Having a son that lives a few blocks away from here, I’ve seen all of the new things going on,” said Walker. Avoiding the need to travel in Friday’s inclement weather, the Governor stayed overnight at his son’s apartment in the former Pabst Brewing complex and was able to see much of that new development firsthand Friday. The brewery’s redevelopment, the development of the new arena and a number of office-to-apartment conversions have transformed Westown in recent years. The Department of Motor Vehicles office located in the current office building may not move to the new building. Walker says the state will consider a second site for the DMV office if the future office building site is close to an existing DMV office. The convenience of the downtown location isn’t lost on the Governor, who noted that he renewed his license by walking to the office when he was Milwaukee County Executive. Anything envolving walker and city of milwaukee, I expect the worst. But this actually doesn’t seem like a bad deal. The new state office building should not include construction of 600 parking spaces. The building is in an urban area and employees should be using mass transit, not driving cars to work. Parking spaces for some State owned vehicles would be ok but no way should 600 parking spaces be built. Look at other city office buildings, commercial or government, in other states, they do not include parking spaces. Milwaukee metro commuters need to get out of their cars and use mass transit. Less cars on the road would eliminate the unnecessary widening of east/west I-94. The widening of east/west I-94 for would be unnecessary if commuter passenger rail were running parallel to the I-94 corridor. Wisconsin and the metro Milwaukee area need to grow up and build commuter passenger rail. Headquarters projects like, Amazon2 are not going to go where there isn’t good mass transit. I don’t think plopping down a state office building on 27th and Wisconsin will be the catalyst for change for the area, but it at least adds some potential customers to any existing or new lunch place (I’m sure they aren’t sticking around after their work day).